This blog post describes three different approaches to educating students for democratic involvement. Which one will you try? 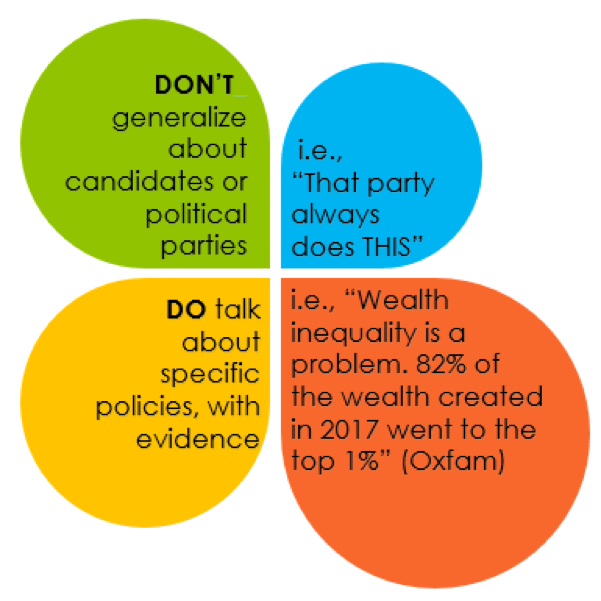 Talk overtly about political issues. Nancy Chick reminds us that students bring their whole selves to the classroom, including current cultural and political clashes, which can leave students in pain. It behooves teachers to tend to classroom dynamics even more than usual in such times (Chick, 2018). Ask students how they feel about a current issue. Take a few minutes from the scheduled content for small group structured discussions using guidelines for respect or silent conversations. To summarize, ask students to reflect on what they learned from someone else during the discussion, using their points to synthesize main ideas. At the very least, instructors can communicate to students that they are open to talking about issues outside of class. Use disciplinary frameworks. Some fields practice mental moves for addressing political issues. For example, a philosopher can show students how to make an argument against separating children from their parents—as well as the difference between using facts, not opinions; an English class can explore the rhetoric of hate groups; a sociologist can use social stratification to analyze racist violence. We can show students how to apply a disciplinary analysis of the issue at hand. Address the issue though course content. 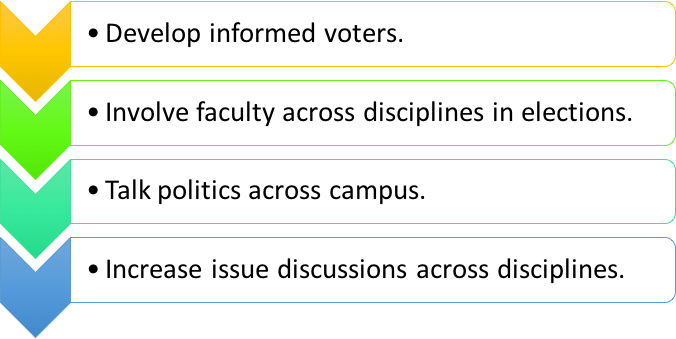 Even in a course in which “diversity” is not the topic, we can choose materials which expose students to issues. For example, in teaching statistics, we can introduce reasons racial violence affects the lived experience of Blacks by applying a new statistical procedure to data about deaths of Blacks at the hands of U.S. police. Or a coding assignment can collect big data on sexual assault. In an English class, students can read about people whose lived experience are very different from their own. Service learning can connect theory and students’ academic lives with their civic lives. 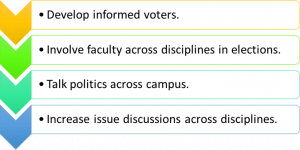 Faculty can prepare students for engagement in democracy by encouraging voter mobilization and student leadership. 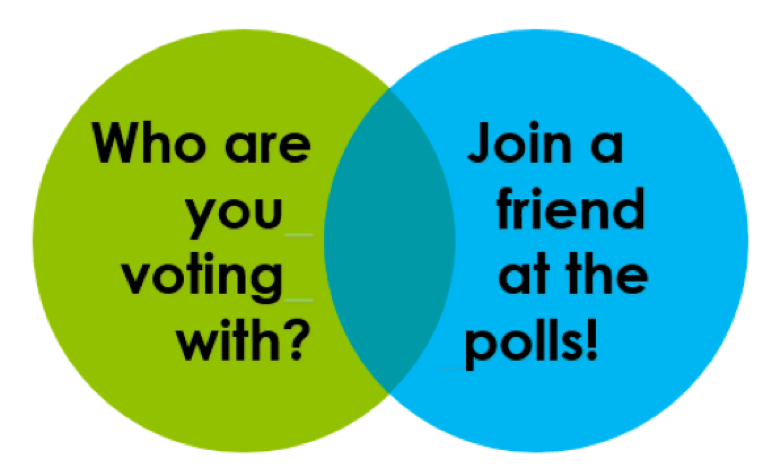 Instructors can improve voter turnout by reminding students of how many days there are left to vote and encouraging voting as a social moment. To create discussion to improve democratic skills, check out CITL events or contact Joan Middendorf at the CITL. University of Michigan Center for Research on Learning & Teaching has discussion guidelines.